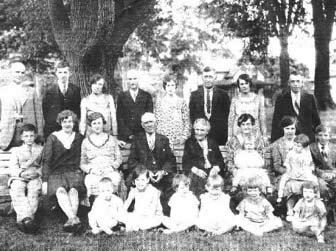 The people pictured are all descendants of Charles Alexander Edgar, or their spouses. They are also all in The Book, Charles Edgar and descendants, pp 277-319, but the photo is not in the Edgar book. The photo was taken at a very auspicious time, since Charles A. Edgar died that same year. I'm assuming it was taken in Lancaster ON, and have asked Phyllis to confirm that for us. The above dates have been added by Alex W. Fraser.